SOUTH BURLINGTON – Following the defacement of several buildings, including Ohavi Zedek Synagogue and the Pride Center of Vermont, a new target has been vandalized this morning. 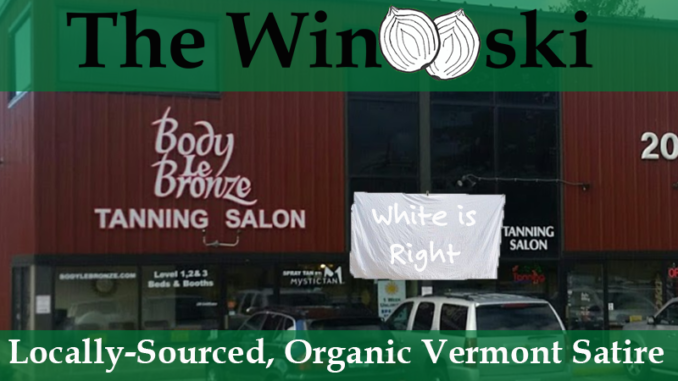 Body Le Bronze tanning salon on Williston Road in South Burlington has been covered with stickers reading “White is Right” and “Ban Tans,” as well as some stickers that read “Olay – Love the Skin You’re In” but with the “Olay” logo crossed out in blue sharpie. harder to see on white sheets and white paper? Anybody know of a place in southern VT where I can find some immigrants to mess with? All the a$$holes around here look like me. Police say they are investigating the website, and are taking all threats seriously.